Welcome to the new MyVogueFabrics.com! Bookmark this site, and check back as we continue to add fun, new features! Check out the photo gallery of our Flagship Store in Evanston! What's on sale in our stores. Plan a Trip to Vogue Fabrics! You can also quickly see all of our store hours, get maps to our locations, and contact us for anything. If you are new to Vogue Fabrics, plan a trip to any of our locations in the Chicagoland area with our links to convenient transportation options. 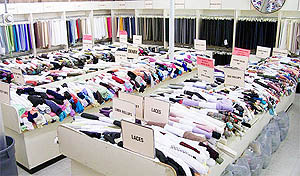 With three retail stores around Chicago, two mail order swatch clubs, one wholesale warehouse, a traveling crew for consumer shows around the USA, and a growing web-store, Vogue Fabrics has a lot to offer! Read all about us! Read about what you will need to register your business for professional discounts and tax exempt purchases, as well as wholesale options. Learn more about how you can advertise your business on this site. 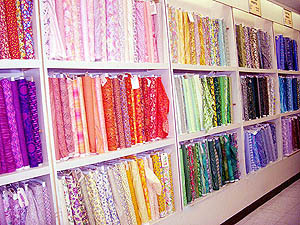 Vogue Fabrics is a family owned, small chain of fabric stores in the Chicago area. 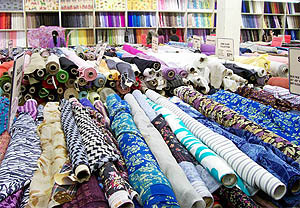 Based in Evanston, Illinois, our local customers join us daily for sewing classes, custom home decorating services, custom covered buttons, scissor sharpening and our wonderful stock of fabrics and notions. Counted among our customers are professional dressmakers, bridal boutiques, milliners, costumers, historical reenactors, fashion design students, interior designers, event planners, and national educators to name a few. In our Sewing Machine Department in the Evanston flagship store, Mac Berg and Jim Borden will help you choose the right Singer, Husqvarna Viking, or White sewing machine or serger or embroidery machine. Our bridal expert is ready to show young brides and their attendants all the hand beaded and imported laces plus other fabulous bridal fabrics for every member of the wedding party. Leading experts, such as Peggy Sagers fro Silhouettes Patterns, Linda Sparks from Farthingales, and Sandra Betzina from Power Sewing all enjoy teaching and shopping at Vogue Fabrics. Members of American Sewing Guild (ASG) and the Professional Association of Custom Clothiers (PACC) join us for special events and enjoy special ddiscounts as well. We welcome you to puruse the pages of this website and check back often as we update it for news on fabric sales, consumer sewing shows, new classes and special events. Enjoy!